Sitting among the gentle hills of Franklin County, the town began in 1825, specifically to serve as the county seat. Several years earlier, in 1818, Franklin County was organized and separated from St. Louis County and the first county seat was designated at Newport. However, Franklin County is very large, encompassing some 922 square miles, and its residents soon signed petitions for the county seat to be moved to a more central location. 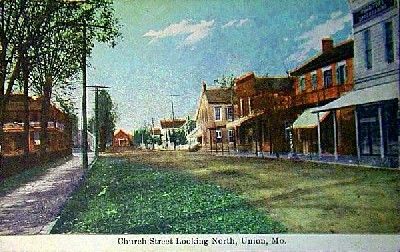 By an act of the Missouri Legislature in 1825, it was decided that a town would be formed within three miles of the center of the county. Three commissioners were designated to secure the land, which was donated by three farmers in the area. Soon more than 72 acres were laid out in blocks for the up and coming new town. The town’s name was earned in an effort to bring about the people of the county. 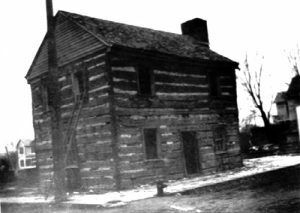 The post office opened on July 20, 1827 and county court was first held in a log building, until a new Courthouse was completed in 1828. Businesses and homes were soon built in the new settlement, which attracted many homesteaders from the eastern states, as well as numerous German immigrants. Strong evidence of these early German travelers is still found in the architecture of the county and is reflected in the many common family names of Voss, Zimmermann, Hoffman, and more. 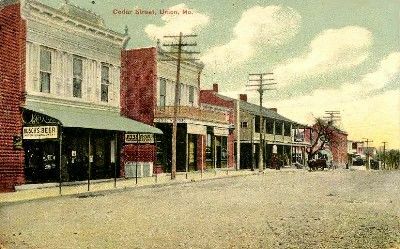 By the 1840s, the town boasted two general stores, a hotel, a tavern, flour mill, blacksmith, and several tradesmen, including a cabinet maker, a shoemaker, and a wagon builder. In 1849 a new two-story brick building replaced the former courthouse upon the public square. Union grew at a slow pace until the St. Louis, Kansas City and Colorado Railroad pushed through in 1887. The town residents gathered in numbers to celebrate the first train arriving in the small town, as bands played in the background heralding the momentous event. Soon a roundhouse and machine shop were added by the railroad, and just four months following the arrival of the iron horse, some forty new homes were built. In 1907, the National Cob Pipe Works factory opened in Union, putting many people to work in the community. Within eight years, the company claimed to be one of the largest manufacturers in the world. Yet another courthouse was built in 1923, which continues to dominate the town square to this day. © Kathy Weiser/Legends of America, updated September, 2016. Reportedly, there is a house in Union, Missouri that is extremely haunted. Read Steven LaChance’s really scary story HERE!